Many don’t know that, after a century of class war, U.S. labor remains the largest and most organized movement that supports progressive issues like peace. I was brought up by a mom who was the secretary of her union local and a factory-worker dad whose lifelong regret was that he never got to be a union member. My parents knew that a strong labor movement was their only buffer between rapacious corporations and themselves. Middle-class Christians might talk a good game, but the reality was that their churches couldn’t or wouldn’t protect workers and poor people from attacks by the 1 percent. As my politics became more radical I went through a period of disappointment that the labor movement wasn’t always reliably on the progressive edge. Some unions were front and center in the great civil rights march of 1963 when Martin Luther King, Jr., shared his dream. Other unions, however, lagged behind, still caught by racism. Because I was a strong peace activist I was especially disheartened if some union leaders beat the drums on behalf of one war or another. Part of my disappointment came from my outsiders’ ignorance of what was going on within the working class, which over the years I’d become distanced from. Inside my graduate-school bubble in the 1960s I didn’t know, for example, that the demographic most opposed to the war in Vietnam was that of people who hadn’t graduated from high school. When 1972 rolled around, I didn’t know that peace candidate George McGovern’s largest share of votes in the presidential election came from the working class. That year most middle class voters, with a pathetic learning curve, still supported the war in Vietnam. Sometimes someone asks me why some working class people vote against their interests, and I ask them to explain why so many middle class people vote against their own interests! In the 1980s, when I joined the resistance against the Reagan Revolution full-time, I worked with unions and began to see the internal dynamics of the labor movement and peace. I organized the Pennsylvania chapter of the national Jobs with Peace Campaign, meant to slow President Reagan’s wholesale transfers of the federal budget from human needs to Pentagon spending. I encountered very strong support from labor in our cross-class coalition. The national level of the AFL-CIO, however, was in alliance with the Democratic Party, which was then (and still is) owned by the 1 percent, which has a great affection for military spending. 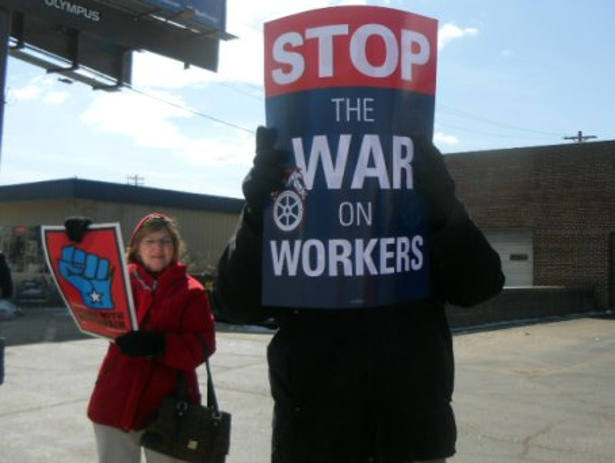 When the partnership of Jobs with Peace to the state president of the AFL-CIO became too close, the national organization forced the state subsidiary to withdraw from our coalition. I rarely meet middle class people who direct their empathy toward the experience of working class families that have been in the trenches for generations. The one time the federal government used Air Force bombers against a U.S. social movement, for instance, was in West Virginia in 1921 — against labor. The decades of attacks on the labor movement and the resulting experience of scarcity left little space in the 1970s for the liberatory culture that middle class activists were exploring through feminism, gay liberation, anti-racism and so on. The 1 percent’s hugely different responses to working class and middle class campaigns increased the cultural gap between the two classes and left most middle class activists even more clueless about what was going on for labor. Many don’t know that, after a century of class war, U.S. labor remains the largest and most organized movement that supports progressive issues like peace. I wish I had a dollar for every middle class peace person who doesn’t know that it was the AFL-CIO that became, in 2005, the first mass representative organization in the United States to come out against George W. Bush’s war in Iraq. Again in 2011, under a Democratic president, the AFL-CIO was the first to call for rapid U.S. military withdrawal from Afghanistan. In both cases the movement reflected the overwhelming opposition of working class people to war even though the military remains a source of jobs in a job-hungry nation. Labor’s stance contrasted each time with the lingering support for the wars among so many middle class (“educated”) people. Whatever our background, our political sense of what’s possible needs to catch up with the global legacy of working class struggles for peace. To take one dramatic example, the labor movement stopped the Swedish 1 percent from waging war on neighboring Norway. For nearly a century Norwegians were, against their will, under the Swedish king. By 1905 they were fed up and determined to declare independence. Sweden’s 1 percent didn’t agree and was prepared to use its much larger army to invade Norway and continue the status quo. Young Swedish worker Zeth Höglund of the Young Social Democrats wrote Down Weapons!, a manifesto for the Swedish working class. The labor movement printed the manifesto in newspapers and printed 100,000 leaflets to hand out to supporters. In the manifesto, Höglund declared that his class would not go to war against Norway and called on young workers to protest their military duty. If Sweden went to war it would need to call up the reserves, just as the United States has done with its National Guard reservists in Iraq and Afghanistan. The Swedish labor movement used that fact strategically, and organized members of the reserves to refuse if the call came. The next step was to announce that if Swedish troops already stationed at Norway’s border crossed the line the Swedish working class would go on strike. The government took the threat seriously because only three years before the movement waged a general strike for suffrage. Encouraged by the Norwegian labor movement, the Norwegian parliament in June officially declared its intention to dissolve the union with Sweden. Swedish Social Democrats took to the streets to oppose Swedish military action, and two weeks later King Oscar II declared that Sweden would not use force against Norway. It’s time to reclaim all of our lost stories of successful nonviolent struggle as we strategize to meet tomorrow’s challenges. As social scientist Kenneth E. Boulding liked to say, “Whatever’s happened is possible.” The empire’s educational system has taken care to forget most of the stories of past struggles, but none of us needs to accept any longer the 1 percent’s self-serving narrative of social movement defeat. I write to express my appreciation for this article by Professor Lakey. The antiwar component of the U.S. labor movement is rarely recognized. The decision of the AFL-CIO to come out against the war in Iraq in 2005 and later to call for the rapid withdrawal of all forces from Afghanistan did not, however, come about without a struggle. That struggle was organized and led by U.S. Labor Against the War (USLAW) and its nearly 200 affiliated unions, labor councils, state labor federations, labor antiwar committees, worker centers and allied labor organizations – organizing that began when USLAW was founded in 2003. The magnitude of that achievement becomes more clear when it is understood that this was the first time in its five-decade history that the labor federation had ever opposed the commitment of US military forces to a conflict anywhere in the world. That decision made clear that the US labor movement was finally prepared to abandon its unquestioning Cold War loyalty to and support for US foreign policy. Irish union members are were persecuted by their own union and the present leadership is covering this up. It is true that antiwar sentiments of American workers are too rarely acknowledged; this article does that and provides interesting personal experience. Go to politicalaffairs.net to see the post. Labor has seldom stood for nonviolence. Strikes are often violent. Sometimes the violence begins with the employer, as often as not with the workers. The element of violence or threat thereof has been integral to the unionized-labor movement since its founding and continues to this day. I suppose, based on some of the comments in your article, you will dismiss my comment as biased, naive or ignorant. It isn’t. I am all for the concerted action by workers, which unions facilitate, and I certainly don’t oppose peaceful strikes, but participants lose my support when they use force to interfere with their employer’s business or prevent “scabs” from entering the employer’s premises. I am not dismissing the good work of unions, just pointing out that peace and violence are antithetical.